There are a huge number of free marketing options, but you might not realise that some can actually harm you. We’ll cover how to make the best use of some of the free marketing resources available, while being mindful of any time cost. 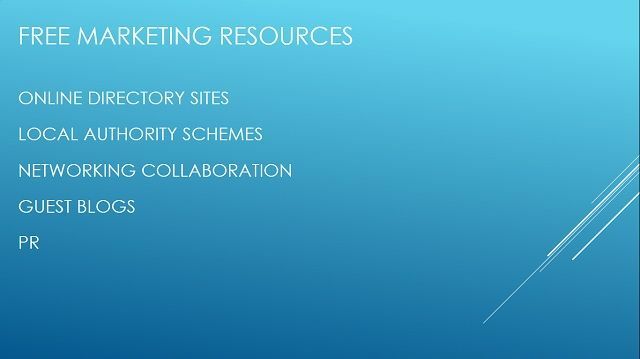 By the end you will have a list of several options for free marketing resources that you can include within your plans. Rather than the old paid telephone directories we talked about previously, there are many online directories that you can sign up with. When looking at where to sign up, it’s better to choose some good quality sites, perhaps local ones where clients may look. You should beware of the services that offer to sign you up with hundreds of sites for a fee, as you can actually find you get a negative google impact on your website if there are loads of low quality links to it. One way to keep up to date with the new sites is to follow local communities online, where these will be publicised as they launch. You could also find that local authorities have their own local business sites, and perhaps a discount scheme they offer to local residents in return for being publicised. Face to face networking can also bring opportunities, if one of the group members has an event stand for their own business then they may let other members of the group use some of their space themselves. There are also online and offline networking groups that run events where you can gain free publicity by agreeing to share some of your knowledge and skills with attendees as a presenter. We talked about blogging earlier, one option is for you to write guest blog posts for other websites. Whilst you keep your core content on your own site, a guest blog will usually have a link back to your site, and can expose you to a different audience. Similarly, you may be approached by others who would like to write a post for yours. Provided it fits with your audience then this could benefit you both. Finally, there is the option of free PR by making sure local websites, newspapers and magazines are aware of you – you may have won an award or you might write an article for them. If you write an article, make sure that it is of benefit to the readers and not promotional – that way there is a much higher chance of it being used. We have covered some of the main free options available to promote your business, and as with the other marketing methods you should see what brings results for you and then focus more energy towards it.